…and what India needs to do to avoid flubs of the sort in the future. India’s decision to procure 36 Dassault Rafale combat jets is an attempt to stop short-term hemorrhaging, but is not a substitute for the urgent need to address both the erosion of the Indian Air Force’s (IAF’s) force strength or gaps in higher defense management that continue to plague the Indian armed forces. On India’s decision to opt for a government-to-government deal during Prime Minister Narendra Modi’s visit to France, Defense Minister Manohar Parrikar indicated that India’s Medium Multi-Role Combat Aircraft (MMRCA) project, which had taken 14 years from the projection of requirements to vendor selection, was effectively dead. The $10 billion MMRCA project for 126 combat aircraft was conceived by the IAF in 2001 with an aim to augment its force strength, which is at an all-time low of 29 squadron as a result of defense procurement inefficiencies, obsolescence and crashes. It then took the Ministry of Defense six years after IAF conceived a requirement to then issue Requests for Proposal (RFPs) for the MiG-35, JAS-39, Eurofighter Typhoon, F-16, F/A-18 and Rafale. The terms of the initial RFP stipulated the purchase of 18 aircraft in “fly away” condition, while requiring the remaining 108 aircraft to be manufactured in India under a Transfer of Technology Agreement with the vendor, which would also be required to meet its offset obligations in India, per MoD’s Defense Procurement Procedure (DPP). 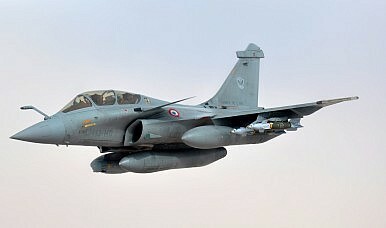 After vendor proposals underwent technical evaluation and field trials, the MoD announced in 2011 that it had narrowed down its selection to two vendors – Dassault (Rafale) and Eurofighter GmbH. In January 2012, India announced that it had selected Dassault as its preferred vendor and would enter into “final talks” before signing the deal. The process then ran into a stonewall. First, allegations of irregularities in the selection process were made in the Rajya Sabha (India’s upper house of Parliament). Then-Defense Minister, AK Antony, whose desire to accentuate above all else his credentials as not being corrupt earned him the derisive moniker “Saint Antony,” ordered a probe that interrupted negotiations with Dassault for four months. Then, negotiations stalled over pricing differences and India’s insistence on guarantees over the 108 aircraft to be locally manufactured by Hindustan Aeronautics Limited (HAL). These differences ultimately proved insurmountable. The government’s decision to source 36 Rafale combat jets from Dassault now raises new questions on how it intends to address significant force strength depletion in the IAF for which the MMRCA was conceived. In the seven years alone that it has taken the Government of India to issue an RFP for the MMRCA and enter into negotiations with Dassault, the IAF has lost 36 MiG aircraft due to crashes (of which a majority have been MiG-21s), as well as 13 other aircraft (including 6 Sukhoi-30MKIs, 3 Jaguars and 2 Mirage-2000s), effectively reducing IAF’s force strength by over 4 squadron. Meanwhile, India’s Light Combat Aircraft (LCA) project, awarded to HAL and conceived as a replacement for its large and antiquated inventory of MiG-21s has faced inordinate budget overruns and delays and has been insufficient in addressing inventory attrition. Self-reliance in defense production is in every country’s national interests, but routine platitudes favoring self-reliance without providing for adequate investments in research and development, incentivizing the growth and maturation of a robust technical and industrial manufacturing base, or liberalizing the defense industry, have created conditions for incredible inefficiencies and a perpetually anemic domestic defense sector incapable of meeting India’s defense needs. Successive Indian governments have prioritized the dogmatic pursuit of indigenization over the need to plug critical national security gaps. The project has taken 31 years to translate vision into some semblance of reality due to a myriad of factors: bureaucratic inefficiencies, limitations in technical expertise, lack of adequate infrastructure and testing facilities and unavailability of critical components due to the technology denial regimes of other countries. Opting to develop a domestically-built engine (Kaveri) for the LCA ended in disaster; after 24 years and investments of about $600 million, it was eventually determined to be unfit for the LCA in 2013 and replaced with General Electric’s F404 engine. Technical advances and India’s changing strategic environment have meant that LCA’s requirements have had to be redefined repeatedly, which have resulted in further delays. The system governing defense acquisitions suffered from a lack of integrated planning, weaknesses in linkages between plans and budgets, cumbersome administrative, technical and financial evaluation procedures, and an absence of a dedicated, professionally equipped procurement structure within the MoD. No congruence existed between India’s national security objectives, its defense objectives, defense policy and directives for the Defense Minister. The defense planning process was greatly handicapped by the absence of a national security doctrine and commitment of funds beyond the financial year. It also suffered from a lack of inter-service prioritization and flexibility. There was dysfunction between technology planning and development and coordination between R&D (e.g., DRDO), production agencies (e.g., HAL) and users (e.g. IAF). There was also no synergy between academic research and Government’s requirements. Academic research is carried out more or less in a policy vacuum. It is unfortunate that successive governments in India haven’t gone about addressing these issues with any level of assiduity 14 years after the committee issued its findings and recommendations. Subsequent studies on higher defense management such as the Naresh Chandra Committee report continue to gather dust and remain classified. Under the circumstances, the ad-hocism and inefficiencies that feature prominently in the MMRCA deal and the LCA project are unsurprising. The proposed purchase of 36 Rafale combat aircraft from France, if the deal does indeed go through, may ease momentary suffering but treats, at best, one part of one symptom and not the root cause itself. The Indian Navy looks for a successor to the now-nixed HAL Tejas Light Combat Aircraft. India's MMRCA Is Officially Dead. Now What?India’s Leap in Space: The Significance of the First Indian Anti-Satellite TestMacron and Modi: What France Can Do For India and What India Can Do For FranceHow Far Have India-US Ties Come After Two Years of Modi?The AgustaWestland Scandal: Is India's Opposition in Trouble?